Could you imagine that you will have a 100-year life? The chances are it is likely. But will you be happy, healthy, fulfilled? You are sure. So will most people who will reach that age. This fascinating book may come as a shock to you. The younger they are, the longer they will live. At the same time, their challenges and choices are far greater. In order to have any meaningful work, we may have to acquire new knowledge and skills – are we ready to be re-educated at this late age? 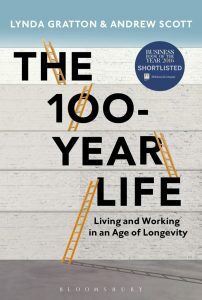 According to the authors (both professors from the London Business School), most people are not prepared for the 100-year life. Their greatest challenge is financial. They simply may not have enough money to live that long. Hence they need to work for another 10 or even 20 years. But it is not just a financial problem. People having a longer live need other intangible assets to survive. These assets come in at least three forms: Productive assets, Vitality assets, and Transformational assets. Productive assets refer to assets that help individual become productive and therefore boost income. Knowledge and skills are major components. Vitality assets refer to physical and mental health and well-being, including friendship and positive family relationships. Transformation assets are of a different order. In a longer life, individuals will have to go through more stages and transitions. Transformational assets refer to self-knowledge, capacity to reach out to diverse networks, and openness to new experiences. 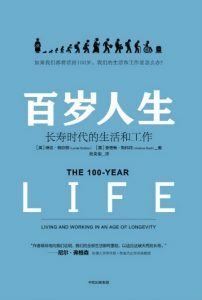 The 100-year life has major implications not only for individuals, but also businesses, and government policies. How will business cope with this new phenomenon? Do it mean progressive lengthening of the retirement age, which is happening all over the world? How to engage elderly workers at different levels of the business hierarchy? Will they be more expensive? Productive? Loyal? For governments all over the world, the advent of the 100-year life poses tremendous challenges. How to look after the health and medical needs of the vast population? None of advanced economies has figured out a way to do this. How many new hospitals need to be built? Where could the already financially strained governments find the funding? How many elderly homes need to be built? Will there be an expanded role for the private sector in this area? How to ensure quality? What will happen to the supply and quality of elderly care? Who will pay for it? Who will care for those who could least afford it? Will there be adequate supply of labour force to cope with the vastly expanded services for the elderly? Is it an opportunity for job creation? How to make it an attractive career option for the younger generation? Will there be increased demand for imported labour? – Many of the developed countries are doing exactly this. How to cope with the expanded re-education, re-training needs of the elderly citizens? Current retraining programs cater primarily for the low-skill jobs. How to serve also the more educated citizens who also need such programs? What will happen to a host of other community needs, such as housing, leisure, transport, welfare services, etc.? How to confront the range of social issues related to old age, such as loneliness, insurance, suicide, physical impairment, etc. In short, most contemporary societies are not prepared for the 100-year life of their citizens. What does all these mean for the social sector or social innovation? There will be more challenges and opportunities and ultimately it will be the social sector (as distinct from the public and business sectors) that will provide the most impetus for change and societal transformation. What will be the catalysts for change? So is all of this hopeless? Will people be forever destined to live longer and linger in a context of corporate policies and government regulations ill suited for this emerging reality? It is our view that, fundamentally, the agents of change will not be corporations or governments – it will be people. Faced with the challenges and opportunities of longevity, it is individuals, partners, families, and networks of friends who will experiment, deconstruct, reconstruct, discuss, argue, and become frustrated. So changed will be piecemeal…. (and) it will probably be slower, lumpier and more tentative than many would hope for. Faced with the frustration of government and corporate norms, people – both individually and collectively – will want to set out themselves to experiment with different ways of working and living. This will all be for the good. It is our view that this arc of experimentation will create opportunities for many people to really explore what is important to them and individuality and diversity will be encouraged and celebrated. There will be lots of variety out there – and from the variety will spring the gift of a 100-year life. Buy a copy of the book today (there is already a Chinese edition). Read it like mad. Even before you finish reading it, the world will look entirely different from your (same) eyes.